When the city of Vancouver, British Columbia, planned to expand their convention center in the late 2000s, they wanted a structure that would reflect the city’s environmental values while tripling the meeting space of the downtown facility. The Vancouver Convention Centre West, designed by LMN Architects and completed in 2009, exceeded their vision: The gentle slope of the 6-acre green “living roof” provides bird habitat; the building is heated and cooled by seawater; and fish and shellfish inhabit the base of the building. The Vancouver project fits exactly with the philosophy of the Seattle-based architects and firm partner Rob Widmeyer ’75. It also contributed to the successes that garnered LMN the highest award in the industry, the 2016 Architecture Firm of the Year from the American Institute of Architects (AIA). Shaw and Widmeyer say the Vancouver Convention Centre West shows how a major civic building connects to its environment. It achieved LEED® Canada Platinum certification, the first convention center project in the world to earn the program’s highest rating. Its distinctive roof—the largest non-industrial living roof in North America—is covered with 400,000 native plants. Below, underwater terraces host mussels, kelp, and Dungeness crabs. These sustainable aspects integrate seamlessly with the convention and retail space. LMN has also made a mark in Seattle with iconic buildings like Benaroya Hall. The firm is leading a $1.4 billion expansion of the Washington State Convention Center, and the architects say they’ll bring in some of the lessons they’ve learned from Vancouver. Throughout North America—such as convention centers in South Padre Island, Texas and Cleveland—LMN often collaborates with other architects even though it has a single Seattle office, says Shaw. He and Widmeyer say they appreciate that the AIA award shows the respect of their peers, partly because of those collaborations. Washington State University also has benefitted from LMN’s expertise. The new Paccar Environmental Technology Building (see below) was designed by LMN, as were the WSU Vancouver Engineering and Computer Science Building, the Biotechnology and Life Sciences Building in Pullman, and the Intercollegiate College of Nursing Building at WSU Spokane. In addition to Widmeyer, a number of other WSU alumni work for LMN, including John Petterson ’76, Tim Rice ’81, Tom Burgess ’82, Jennifer Milliron ’01, Kjell Anderson ’02, Robert Smith ’01, Tyler Schaffer ’05, and Mark Lo ’10. LMN has also assisted with WSU student portfolio review and other educational projects. The new Paccar Environmental Technology Building (PETB) brings together interdisciplinary research and education in clean technology, like renewable materials, sustainable design, water quality, and atmospheric research. 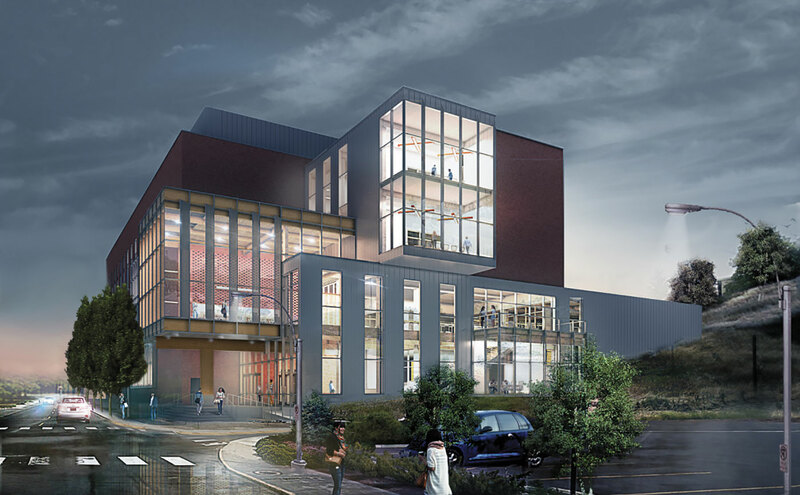 The building is constructed using renewable materials and technologies developed at WSU, including wood composites, recycled concrete, and pervious pavement, all of which help make it the greenest building constructed so far at WSU Pullman. Located on Grimes Way, a block from the Lewis Alumni Centre, the PETB labs and shared common spaces house researchers from engineering and other disciplines to work on reducing the region’s dependence on foreign oil, minimizing carbon footprints, and improving air and water quality. Read more about WSU’s Clean Tech research.